General Hospital (GH) spoilers for Tuesday, April 3, tease that Jason (Steve Burton) will be on a mission for answers. He got a huge clue and he intends to follow up on it. GH fans can expect Jason to question Finn (Michael Easton) about the night Faison (Anders Hove) died. He’ll hope to find out who stole Faison’s lighter since that news would lead him straight to Heinrik. Will Finn be able to offer any more hints? Jason probably still has some work to do before he solves this mystery. Nevertheless, it’s clear that he’s getting closer. Meanwhile, Peter (Wes Ramsey) will deal with drama from a different source. Griffin (Matt Cohen) just showed up for a confrontation, so things are sure to get heated. General Hospital spoilers say Griffin will push Peter to come forward and spill his true identity. He’ll think Peter needs to go to the cops and take responsibility for his actions. Peter may lash out at Griffin for digging around and discovering that he’s Faison’s son. Since Peter has no intention of confessing, he might suggest that Griffin can’t say anything or his whole career will blow up. Of course, Peter could also share his sob story and hope to get Griffin on his side. By the end of this conversation, Griffin will have a big decision to make. At the police station, Maxie (Kirsten Storms) will sit down at Nathan’s (Ryan Paevey) desk and long for her husband. Her grief should get worse thanks to a PCPD tribute to Nathan. Detective Chase (Josh Swickard) will also pop up in Tuesday’s episode. When he sees Maxie and realizes who she is, he’ll be gentle and respectful. Chase will softly point out that Nathan left some big shoes to fill. He might contend that he could never replace Nathan, but he’s honored to take his seat anyway. Other General Hospital spoilers say Nina (Michelle Stafford) will give Curtis (Donnell Turner) updates on Peter (Wes Ramsey). She’ll explain her concerns and push Curtis to dig up plenty of dirt. Nina will hope Curtis can find enough to get Maxie away from Peter for good. Across town, Andre (Anthony Montgomery) will be worried as well. He’ll believe Anna’s (Finola Hughes) got blinders on when it comes to Heinrik. Andre just won’t want Anna to be lulled into a false sense of security. He’ll hint that Faison’s son could carry on in his father’s wicked footsteps. At GH, Franco (Roger Howarth) will express his fears during a session with Kevin (Jon Lindstrom). He’ll admit he doesn’t want to do what he knows he must. This undoubtedly ties in with Franco’s childhood trauma. He has to get the rest of the story or he’ll never find peace. 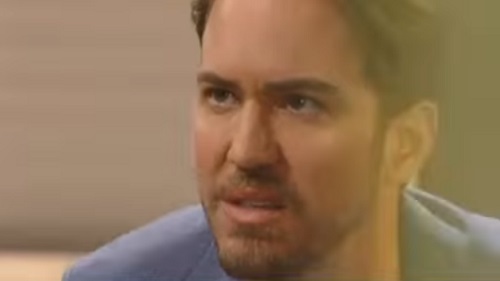 Without that peace, Franco can kiss his future with Liz (Rebecca Herbst) goodbye. Fortunately, Franco will move past his concerns sooner or later. The truth has to come out! Will Betsy (Deborah Strang) reveal something? Will Franco get another chance to pry info out of Jim (Greg Evigan)? Regardless, Franco has a serious crisis headed his way. General Hospital has some crazy action in store. We’ll keep you posted as other GH details emerge. Stay tuned to the ABC soap and don’t forget to check CDL often for the latest General Hospital spoilers, updates and news.